1/1/1:100.200" how many tags will there be on the frame when it egresses from the SAP on PE-B? existing sites and the new site has to have access to all existing sites. How should the new site be added to VPLS 300? It is not possible to meet the design requirements. 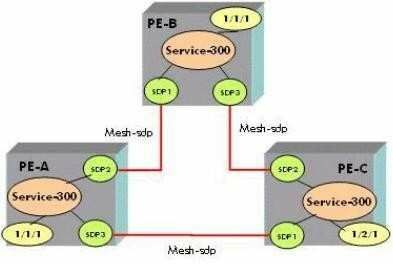 Configure a spoke-sdp between PE-C and PE-D.
More information is required to determine the fate of this new frame. The frame is discarded if the destination is unknown. The frame is forwarded and MAC learning is automatically disabled. entire FDB in the VPLS instance will be flushed. Stale information will be used within the VPLS instance to forward traffic until the FDB ages out. MAC addresses associated with the PE that the failure occurred on will be flushed. Based on the following configuration which VLANs will be managed by the management VPLS? What is PBB also known as? What function in IEEE 802.1 ah helps to limit the amount of MAC addresses learned in the core? The following question relates to this command syntax: "config>service# vpls 9000 customer 6 create". The customer-id in this command is 9000. The egress vc-label will be 9000. The vc-id will be 6 for the service by default. The service-id in this command is 9000. This value 9000 should be unique across the network as a best practice. Which of the following best describes the difference between VPWS and VPLS? Unlike VPLS. VPWS appears as a multi-hop network to the customers. Unlike VPWS, VPLS is a service where customer MAC addresses are learned. each other as if they are connected via a bridged LAN. 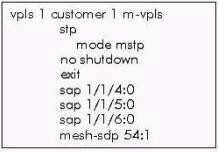 Unlike VPWS, VPLS allows customers to view the network as a routed network. frame. What is the result? new local MAC addresses would continue to be entered. The new source MAC addresses will not be entered in the VPLS service forwarding database. 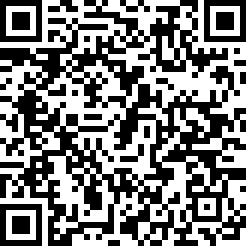 remote MAC addresses would continue to be entered. Which of the following needs to be considered when designing Ethernet networks with redundancy? Processing the TTL takes extra time. Requires a protocol to remove loops. MAC learning rate is doubled. In RSTP, how is the root bridge selected? The switch with the highest bridge-id is selected as root. The switch with the lowest MAC address is selected as root. The switch with the lowest bridge-id is selected as root. There is no relationship between the age-time and the amount of flooding. The higher the age-time, the greater the amount of flooding. The lower the age-time, the lower the amount of flooding. How does PBB forward broadcast, unknown-unicast and multicast traffic from a B-VPLS to an l-VPLS? The receiving PE checks the l-TAG in the l-SID to determine if there is a local l-VPLS on the node. matches a local l-VPLS on the node. The receiving PE checks the l-SID in the l-TAG to determine if there is a local l-VPLS on the node. The frame will be fragmented.